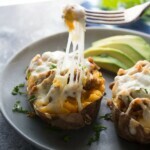 These lighter sausage stuffed sweet potatoes are made using crock pot sweet potatoes, making it ready in under 30 minutes! Perfect for a busy week-night dinner or as a lunch. In a medium non-stick pan, cook the sausage over medium heat, breaking the sausage up with the spatula into small crumbled bits. When sausage is cooked through (around 6 minutes), remove from pan and drain excess fat on a paper towel-lined plate. Gently scoop the insides out of sweet potatoes, leaving the skins intact. In a medium bowl, combine sweet potato puree with Greek yogurt, salt and ground cumin. Mix until smooth and completely combined. Arrange the sweet potato skins on a parchment-lined baking sheet, and gently spoon the filling back in. Scatter the sausage evenly over the sweet potato skins, then top with shredded pepper jack cheese. Bake in oven for 10-15 minutes, until cheese is melted and slightly browned. For me, this took 12 minutes.